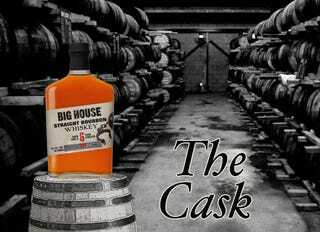 Today we're going to discuss a Bourbon Whiskey for the first time - Big House Straight Bourbon Whiskey. It must be aged for a minimum of 2 years. So why did we cover that much info about Bourbon? Well, to be honest, a lot of people don't have any idea how Bourbon is different from other American Whiskey. It's a lot easier to say Scotch and people instantly associate it as "oh yeah, Whiskey made in Scotland", same goes for Irish and Canadian. "MontegoMan - Enough with the Bourbon lesson! Does it taste good?!" Is I'm sure what you're saying by now, so, on to the ratings! As far as Bourbon's go, it's one of the least expensive you can find. The only bottle I can think of for less money would be Jim Beam at around $18 a bottle. If you remember from the last edition of The Cask, here's the way I do the rankings, 1 being the best. So part of my quality ranking is a bit skewed on this one, and I admit that. The flavor of Bourbon isn't my favorite. That doesn't speak to this Bourbon though, but all of them. For a true Bourbon drinker, I feel the quality of this could easily be a #2. For me? I need some actual Ice to turn to water with Bourbon. This is good Bourbon and a good price for it. It's actually my first recommendation when someone is looking for a Bourbon to try. Also, it has a nice friendly 90 proof (45% abv) vs your typical 80 proof. It's smooth, it's strong, and it is definitely not short on flavor. If you're looking for a nice Bourbon - I will definitely recommend Big House Straight Bourbon Whiskey. Anything you'd like me to review for The Cask? Let me know in the comments!